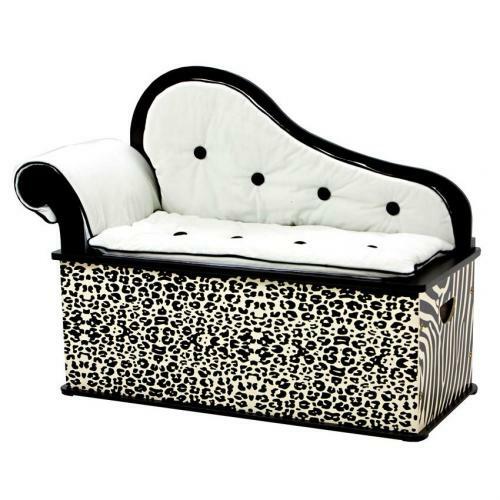 Animal Print Chaise Lounge Bench by Levels of Discovery - Take a walk on the wild side with this animal print chaise lounge bench. The comfy chaise lounge chair doubles as a toy box. Kids storage furniture just got a lot more stylish! 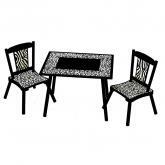 This jungle theme play furniture has an exotic zebra print and a wild cheetah print. The bold contrast of black and white animal prints make quite a statement in any jungle theme play room. 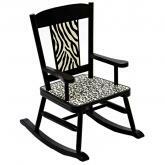 The Wild Side Collection of animal print play furniture includes the Wild Side Chaise Lounge Bench, the Wild Side Rocking Chair, the Wild Side Step Stool, and the Wild Side Table and Chair Set, each with the bold combination of zebra print and cheetah print. Be sure to check out Levels of Discovery's entire Wild Side Collection to complete your fun animal print jungle room.